In 1921 Gerald Dunlop Murphy came north to Fort Norman (now Tulita). He was the mining recorder for the Federal Government’s Department of the Interior responsible for registering oil claims during the staking rush that eventually became the Norman Wells oil field and the Town of Norman Wells. Murphy quit his position with the Federal government in 1929 to create Murphy Services Ltd, a partnership that included Vic Ingraham and Tim Ramsey. From a mill on Sawmill Bay Murphy Services supplied lumber for the construction of Eldorado Mine on Great Bear Lake (map). After a brief time in Goldfields, Saskatchewan Murphy moved, in 1937, to Yellowknife. As one of the town’s earliest residents, and one of its greatest promoters, he quickly became known for his interest in developing Yellowknife as a proper community with all the amenities of a more southerly city. Gerry Murphy personally took on what he felt was a worthwhile community project, raising funds for the construction of an indoor arena. 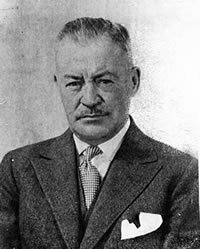 Even though he had taken up temporary residence in Norman Wells, as the Administrator of the newly constructed Canol pipeline, he still played an active role in fund raising for this project.